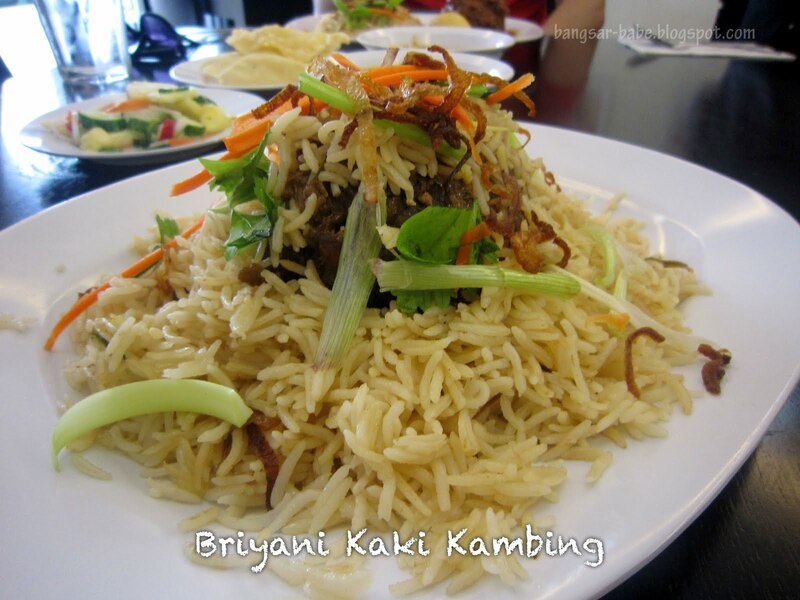 There are many variations of the briyani — Hyderabadi Briyani, Pakistani Briyani, Sri Lankan Briyani, Iranian Briyani and many more. But the version I’m most accustomed to is the Malaysian Nasi Briyani, with my favorite being the Nasi Briyani Gam from Batu Pahat, Johor. When we don’t feel like driving all the way to Batu Pahat, rif and I usually get our briyani fix from this briyani place in Subang Jaya. However, we decided to try some place new — Restoran Ruz Aladdin in Taman Tun Dr. Ismail. The outlet has air-conditioning, which is a relief in this crazy hot weather. 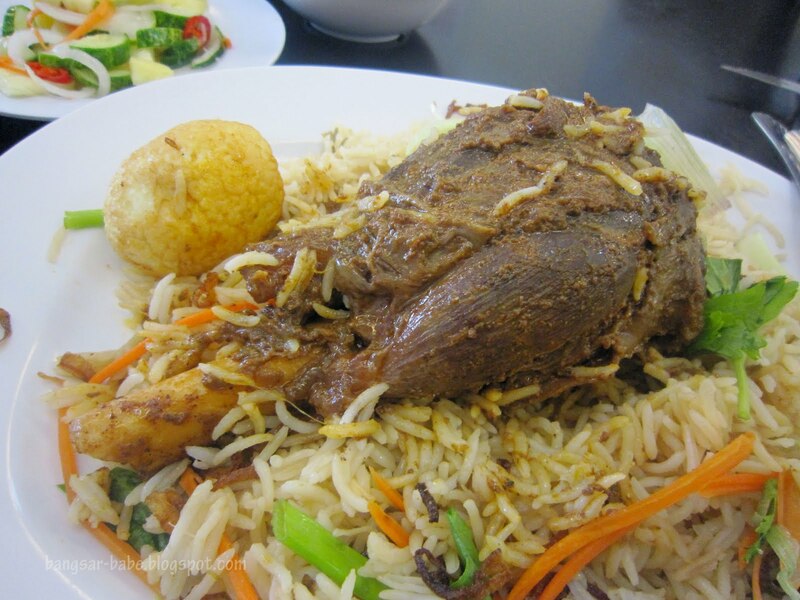 Lamb briyani is pretty common but lamb shank briyani isn’t; at least not to me. 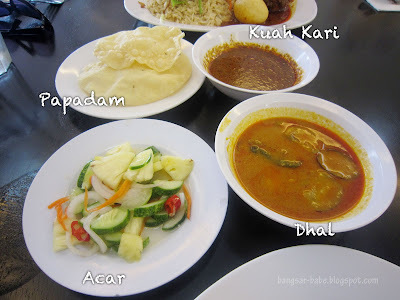 When I spied Briyani Kaki Kambing (lamb shank briyani) in the menu, I ordered one to try. It turned out to be pretty good. The lamb, cooked till tender and falling off the bone, was well-infused with spices. The briyani rice was adequately moist and fluffy with a good aroma. I enjoyed this with generous helpings of dhal and chicken curry. The latter was thick, spicy and flavourful. You also get a side of acar (vegetable pickles) and papadam with your briyani. 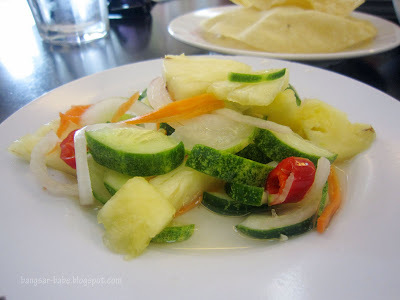 For RM25 per serving, it is slightly on the pricey side but still worth trying. Portion is pretty generous, so two small eaters can opt to share this. 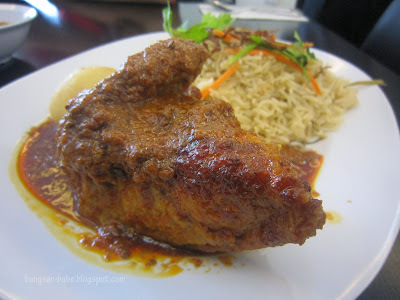 rif’s Briyani Ayam Masak Merah (RM13) was nothing to shout about, partly because we were given the chicken breast. While he wasn’t very petty about this, I was. The meat was dry at the centre; a shame because the tomato-based gravy was quite tasty. If I were to order this in future, I’d insist on getting the chicken leg. 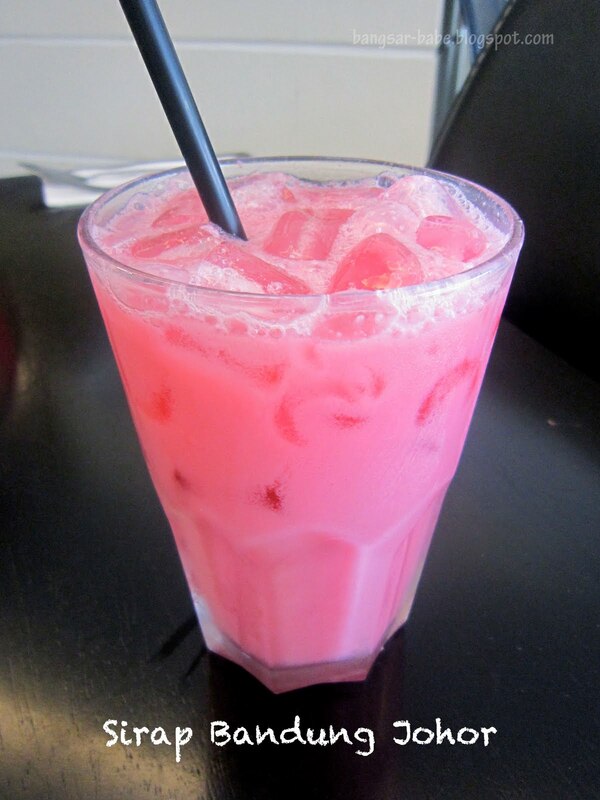 The Sirap Bandung Johor (RM4.50) is made using rose syrup, evaporated milk and ice cream soda. Ruz Aladdin’s version was ‘kau’ and fizzy; very refreshing in the hot weather. 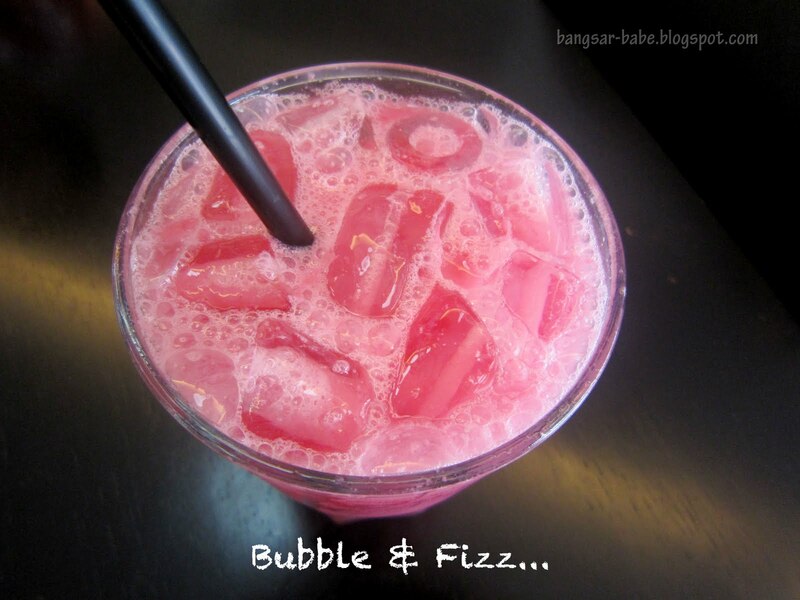 Some people might find this a tad sweet, but that’s how good sirap bandung should taste like. On a whole, we were pleased with lunch. Service was friendly and attentive, and the food was decent. Verdict: If you want Briyani Gam Johor without having to drive all the way to Batu Pahat, check this place out. Hi BB, I have a recommendation for you to try some good beriyani I sampled twice. 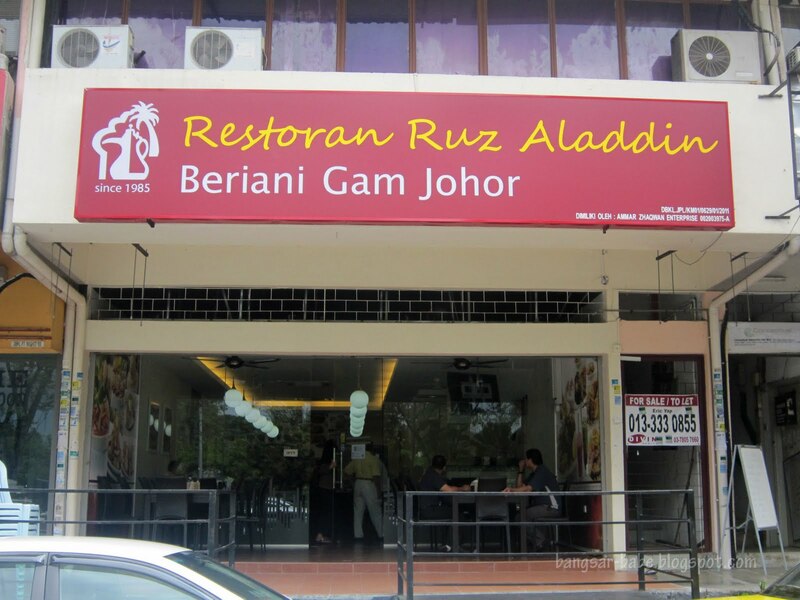 Go try out Zam Zam Restaurant, right next to Frenz Hotel at Jalan TAR/Masjid India area (down the road from Sogo, on the left). One plate of beriyani is enough for two people to eat! And very tasty too. Prices? Seems reasonable for the amount of food they give you. 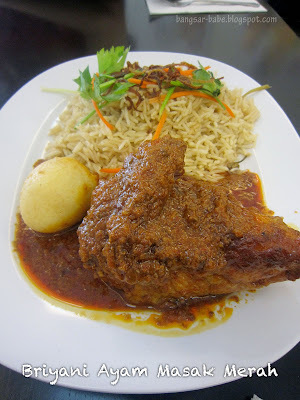 Sean – Dunno about Johor laksa, but the briyani gam is good! Hi BB, I tried out the Briyani at Ruz two days ago .One thing I found out when I asked why the bandung tasted different; they add some nescafe to it! Whre is the restaurant? Is it restoran Ismail? Wld like to recommend new restaurant in Tmn Tun called Meat Point. Had dinner thre last nite n the steak, grain-fed, was scrumptious lay tender, evn when well-done. And the spaghetti olio agile with scallops is quite sublime, n not too pricey at RM19.90. The steak tho was abt RM64 but worth every sen. The lychee passion drink is super and service is attentive, unlike that of Kokopelli in PJ, an outlet with great food but inconsistent service and which, I n my daughter, wld enter with some trepidation as we don’t know what to expect. Imagine, the first time we went there, we were asked to move tables. I’ve eaten in the UK, where I studied or 6 yrs, in Singapore, in Turkey, and thru out Malaysia but have never experienced such ‘treatment’. N when I once asked for the beef bacon to my Caesars salad to be separate, the owner told me he cldnt do it as presentation was of utmost importance! Imagine! The customer is less important than the presentation! 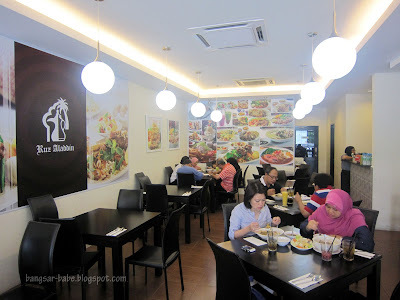 Recently, when I asked whether their meats n cheeses were halal, the other owner came up to me In not too pleasant a manner, explaining abt the halal produce they use. I never get that at Dome, TGIF, Italiannies, Chillis or evn at hotel coffee houses! PJ residents n most Malaysians are well-travelled and eat out extensively. We’re not from the boondogs and the restaurant owners shld tret thr customers with more respect, especially with the prices they are charging!